Triple Crown window cleaning poles are all about usability. They are lightweight and can be handled easily and safely. The pole reaches from 4 feet to 30 feet. The collars for this window cleaning pole are adjustable with easy locking mechanisms, which secure the poles at the desired length (be sure not to over-tighten). 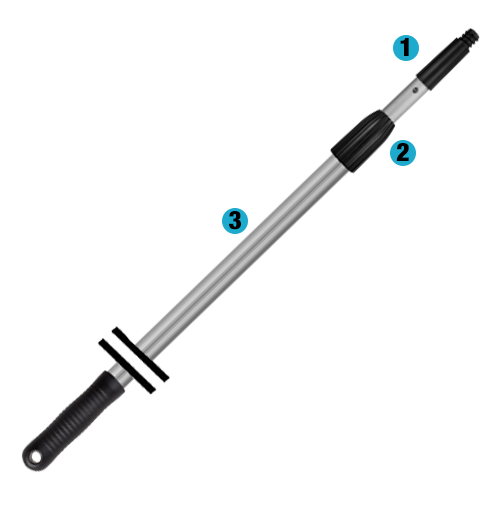 Triple Crown window cleaning poles come with a tapered tip that ends in acme threading. The poles work with most tapered and threaded tools. Triple Crown poles offer all the replacement parts and accessories you need for window cleaning. Drop or add sections for up to 4 different lengths. Triple Crown poles work well but are best known for their value (aka they are less expensive). Many professional window cleaners choose Triple Crown poles because they know the poles will help them get their jobs done, day after day.